I am the daughter of a farmer. Well, a farmer who decided to go to college and become a teacher. Instead of growing hundreds of acres of corn and soy beans in South Eastern Minnesota, my dad planted a quarter acre of sweet corn, bell peppers, zucchini, and radishes in the backyard. My grandfather and my great-grandfather were both farmers who spent their whole lives growing things. You would think that I had a pretty good shot at a green thumb. But no. Oh, once upon a time, when I had one young child and no outside commitments, I did pretty well at growing things. Hubs created raised beds surrounded by a picket fence. I loved spending time in the garden and harvesting home grown fruits and vegetables. I was Queen of the Green. Now, fifteen years later, I’ve tried my hand at container gardening and failed multiple times. It’s kind of depressing, actually. The kids planted me an herb garden this summer, and I think I killed it. I’m kinda afraid to go out and see. It’s a dilemma because I often need fresh herbs for recipe testing, but buying fresh herbs at the store can be counterproductive to creating good cheap eats. They’re so pricey! And while our produce box does often include fresh herbs each week, it’s not usually the fresh herb I need that week. So, when AeroGarden offered to send me a foolproof aeroponic garden, I couldn’t say no. It was worth a shot! My girls, 5 and 7, helped me set up the garden, brought me jars of water to fill it, and planted the pods. They were thrilled with this activity. I can’t kill this basil! 1. Fill the tank with water and nutrients. 3. Place the germinating domes. 4. Watch the plants grow. 5. Add nutrients and water when the computer tells you to. Yay for easy container gardening! Prior to this experiment, I really had no idea how many different kinds of basil there were. I usually buy Genovese basil, a readily available variety, traditional for use in pesto. The other varieties we planted include: Lemon, Thai, Neapolitano, Globe, Marseille, and Red Rubin. The scent of the lemon basil is amazing! I think I want it planted by my pillow. For reals. I have the garden set up in an area just off the kitchen, just a few steps from my work area, so I can grab a few leaves whenever I want to add fresh herbs. The lemon basil was absolutely amazing in the baked brie recipe I created. On an ovenproof baking dish, place the Brie cheese. Layer the basil and almonds over the cheese, pressing slightly. Spoon the cranberry sauce over the almonds. Sprinkle with the crushed red pepper. Bake in the oven for 15 to 25 minutes, or until the cheese is hot and melted. I love this recipe because there are only five ingredients, plus bread or cracker dippers. You could fudge and cut it down to four ingredients by omitting the crushed red pepper, but either way, it’s delicious, easy, and an elegant way to entertain this season. Scan your local Costco or Trader Joe’s for great prices on Brie this time of year. I also find it marked down once in awhile at my local grocery store. It’s a delicious and elegant splurge for the holidays. 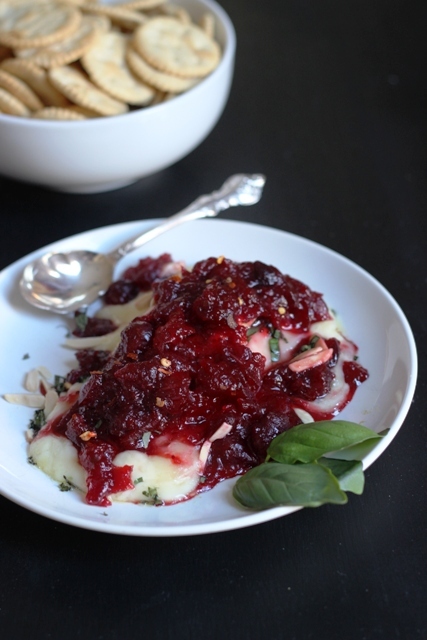 This appetizer is so incredibly festive (Red! Green! White! ), without being overdone or time-consuming. 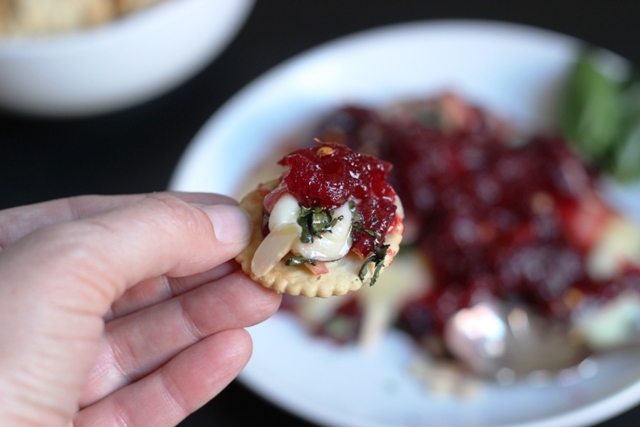 You can literally grab the brie, cranberry sauce, and almonds on your way home from work, pluck a few leaves of basil, pinch away from the spice cupboard and within half an hour have an elegant appetizer to serve to friends and family. What better secret weapon could you keep in your back pocket than this? It’s perfect for upcoming holiday parties, but I wouldn’t blame you if you eat it all yourself. The leftovers are great on turkey sandwiches, too. Wanna grow your own garden or gift one? Disclosure: I’ve partnered with AeroGarden and Kitchen PLAY to demonstrate how easy it is to grow your own herbs at home. I’ve been compensated for my time. All opinions are my own. What’s been YOUR experience with growing fruits, vegetables, and herbs at home? My basil is freaking out right now. Have to make pesto tomorrow. It’s amazing. Your baked brie recipe looks amazing. I have to try it out. And I kind of know how you feel about gardening. I can’t keep anything I planted alive, and it always feels like murder whenever I see a plant die. I also live in the frozen, dark north though not as far north as Calgary. Honestly, my tiny Aerogarden that sits on my kitchen counter is a life saver because of the *light*! And the plants. 🙂 Mine is a couple years old and was bought on a Black Friday sale. It’s pretty brainless and for someone who is typically very busy in the winter months, having not to remember when to feed plants, etc. is just wonderful. Every time I look at my tiny arugula and lettuce plants (just started last week), I get a smile. I’ll have to try basil after the salad greens. Brighid, now I REALLY have to visit the site–knowing that I can grow lettuce in the winter? Priceless! I can’t wait to try lettuce, and tomatoes, too. Jessica and Brighid, which unit do you have? Went to the site; I’ve seen these somewhere before but love getting real opinions! This may go on my Christmas list! I think they sent me the Ultra. 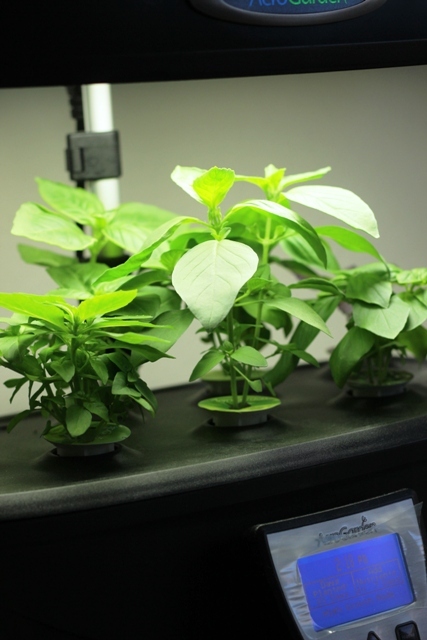 I have the Aerogarden 3 in white. It’s the most basic one and was about $35 from our local Ace Hardware store after rebates two years ago. I toss in my regular seeds now also. Oh my gosh, these are like little bites of bliss! I’m a total sucker for any warm and melty brie concoction. Love the sweet/tart/peppery-basil combo you’ve used. This is great – I had a question about these. I was thinking of getting one for my mom, but she would have it in an RV and I was wondering if it makes too much noise to be in such close quarters? Ours doesn’t make a lot of sound. Occasionally it sounds like running water, but certainly not all the time. Just once in awhile.